Hello again everyone! It’s been a while since I’ve written a blog post, because I have actually not traveled anywhere since November! Four full months in Ottawa – it’s been a while since that has happened. Well, to end the non-travel spell, I have come to Dhaka to work on our environmental institutional strengthening project. This is the project the keeps bringing me back to Dhaka – this is my fourth trip here. Previously I was coming about once every six months, but this time it’s been just over a year since my last trip to Bangladesh. In that period of time, British Airways stopped flying to Dhaka. Which, after having gained enough points with BA to actually mean something, I was disappointed about! So this time, I tried a different out – on Emirates, via Dubai. I was a little excited about this because, for one – I got to fly on the A380 – the GIANT plane by Airbus, and secondly, I got to see a tiny bit of Dubai! My journey was uneventful which is always a good thing in air travel. I flew from Toronto to Dubai direct on the A380 – which is about a 13h flight. The A380 is simply huge. It dwarfs most other planes while standing at the gate. It is two levels, with the second level (at least on Emirates flights) being for business and first class. There is even a shower up there! I was not up there. I was on the main level in economy, but I managed to get a really good seat, and in the end the plan was only 2/3 full (apparently this is abnormal – it is usually full) and so I ended up being able to sleep across a couple of seats. I was in row 81 to give you an idea of how big the plane is, and there were at least 10 more rows behind me. Despite the number of people on the plane, disembarking did not take that long. 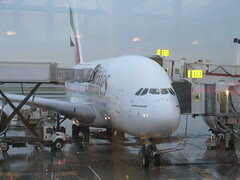 All in all I was pleased with Emirates – good service, decent food, on time and they didn’t lose my bags. I landed in Dubai around 6 or 7pm and headed to my hotel. I was surprised with how orderly everything is. The airport (I went through the new T3) is incredible – super high ceilings, everything is shiny and clean. I had no problems finding where to get a taxi, and contrary to what I had imagined, there was a taxi stand with all sorts of taxis waiting patiently for passengers – no one shouting and pulling me in one direction to their cab. And the taxis were metered!! Another interesting note – my taxi driver was a woman, who I think was from India. I don’t think I’ve ever had a woman taxi driver before in my life, and Dubai is probably one of the last places I would have thought I would have a woman taxi driver. Dubai is an interesting city. Flying in, all you see is desert, until all of a sudden you are landing in a huge city. There is lots of traffic, but it was all orderly (unlike in Dhaka!). People used their turn signals and drove within the lane markings and everything! I was not in the city centre, but staying closer to the airport. I would have loved to have a day to see the place better. What I did see included lots of tall buildings and hotels, mosques, restaurants and road construction. The people in Dubai come from all over the place. 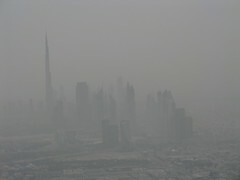 A lot of Asians and South-East Asians go to Dubai to work (for example in construction or in the service industry). I saw quite a mix of backgrounds in the people I dealt with while I was there. You can certainly tell there is a lot of money there (or was a lot of money there before its economy crashed). It’s not easy for the people who go there to work. Most of them leave their families back home, and probably send most of the money they make back home to them, traveling home to see them only once a year, if that often. My plane from Dubai to Dhaka was packed with Bangladeshis, most of whom probably work in Dubai (and interestingly, some of the luggage that came off the carousel in Dhaka was originally from Doha – so some probably work there too). Things are not cheap, that is for sure. The hotel was reasonably priced and was quite nice. Again – shiny and clean. The service at the hotel was great – everyone was so friendly. A colleague of mine was actually staying at the hotel that night too – so we went out for some dinner to a pretty nice restaurant. It ended up costing about 55 USD each – now apparently that is pretty expensive, even for here, and included a glass of wine. But the restaurant was really cool – it was a fish restaurant and you pick out your own fish (it’s not still alive). The fish was so fresh and delicious, I would pay that much for dinner there again. 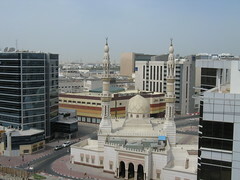 On the way back to the airport the next day, I had the taxi stop at a mall – called the Dubai Shopping Centre. I just wanted to see it – but next time I have time I may go there to shop! I was expecting something big, but I was not expecting all the European designer shops. Again, the mall was shiny and clean, not full of people but then it was noon on a weekday, and quite large! Once back at the airport, I had a good chuckle as the flight attendants made people who were carrying too much carry-on (often involving a lot of duty free items – but not alcohol because Bangladeshis are not allowed to import alcohol to Bangladesh) check their bags - like the guy who had about 4 bags and was saying that it wasn’t too much. I am looking forward to seeing what there is to buy in the airport on my way home though! That’s about all from the trip here – the flight to Dhaka was equally uneventful and I was please that my bag showed up here when I did. As for Dhaka – well, I don’t think anything could highlight the poverty and disorganization here more than stopping en-route in Dubai. Traffic seems worse than ever. There is a power shortage at the moment – every other hour the hotel is running on its generator, and shops are not supposed to stay open past 7pm unless they have their own generator. All of which, I am sure, is not helping the already poor air quality. Apparently there is also a water shortage, though I don’t know the details. They are hoping for the rainy season to start soon so as to ease some of these problems. Submitted by Jenn (not verified) on Tue, 2010-04-13 21:36. Submitted by Kim (not verified) on Sun, 2010-04-11 09:41. Glad to hear that your flights were uneventful and that you arrived safely in Dhaka. The A380 sounds really cool. I'd love to see what first and business classes look like!